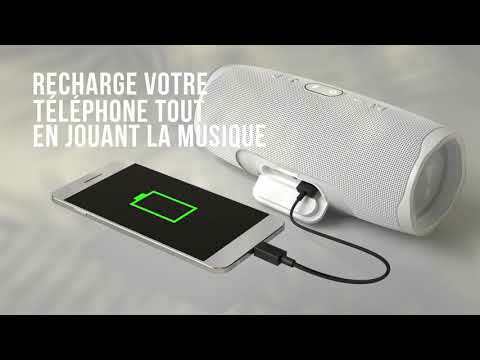 JBL Charge 4 est évalué 4.5 de 5 de 206. Rated 5 de 5 de Juhi96 par Feel the beat Eine super Box, sehr kraftvoller, satter Sound! Der Bass ist unglaublich für eine so kompakte Box und die Mitten und Höhen kommen sehr klar rüber. Wie immer ein super Produkt von JBL! Rated 5 de 5 de DeezN74 par Awesome Took on spring break, beat the heck out of it on the beach, boat and pool and it still cranks out loud tunes. Rated 5 de 5 de AvengingWizard par Simply Awesome! I bought this product about 2 months ago upgrading from the Charge 3 which I gave to my dad. I noticed the bass seemed noticeably cleaner than the 3 and overall has very good sound quality and is still compact enough to take most anywhere. I am very happy with the product. The power button however recently got stuck in the down position but i contacted support and they are working with me to get a replacement, and they made it very easy! I love these guys speakers very much, definitely the best I've used!